Oreo biscuits 1 pkt Britannia Cake (all Flavours) 1 pkt Brit.NutriChoice 5 Grain 1 pkt Cream Crackers biscuit 130 gms Snacks Zig Zag 1 pkt Alive Filter Coffee 100 gms Assam-premium-tea 500 gms Groundnuts coated with Chilli powder 100 gms Macroni 200 gms Knorr Thick Tomato Soup Mix 50 gms Dabur Honey 50 gms Amul Britannia Bourbon Biscuits 112 gm cheese tin 400 gms Cadbury Silk(roast Almond) 1 pkt Assorted Biscuits in a tin 700Gms. Bounty 57gms. Snickers 57gms. 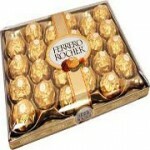 Ferrero rocher 16pcs. Pringle chips 140gms. Foxes tin 180gms. mint, fruits and black current Lays chips 56gms. 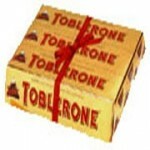 Bread 100 gms Biscuits 100 gms Lindt 100gms. Walkers 150gms. Cheese Kraft 200gms. Cadburys Silk= 145Gms. 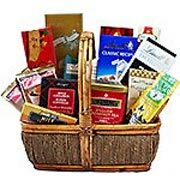 Almonds 200gms Britannia Krack Jack 1 pkt Bingo 1 pkt Britannia Good Day ( Butter ) 90 gms Unibic Almond ButterCookies 1 pkt Unibic Pista Cookies 1 pkt Brit.Time Pass Biscuit 1 pkt Badam ( Almond ) 50 gms Amul cheese tin 400 gms Zess Chocolate Coated wafers 480Gms Biscotto Wafer Rolls 370 gms. Bounty 57gms. 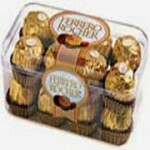 Ferrero rocher 16pcs. Jackers. 150 Walkers 150gms. Cadburys Silk 145Gms. UNIBIC Cookies 100 gms Almonds 200gms. Gift container shown is indicative and may vary.